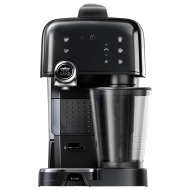 alaTest has collected and analyzed 190 reviews of AEG Lavazza A Modo Mio Fantasia LM7000. The average rating for this product is 4.6/5, compared to an average rating of 4.4/5 for other products in the same category for all reviews. Reviewers are impressed by the price. We analyzed user and expert ratings, product age and more factors. Compared to other products in the same category the AEG Lavazza A Modo Mio Fantasia LM7000 is awarded an overall alaScore™ of 90/100 = Excellent quality. This machine uses pod coffee from Lavazza and they do a huge range so you should find at least one you like, it also has a fool proof milk frother jug as part of the unit now there is no longer an excuse not to have a perfect Cappuccino at home. The and and it's available in black, white or cream. Very helpful and informative LavAzza personal (Angie). Gave a clear precise overview with no hard sell. Machine gives great coffee and just as easy to use, as we were shown. It looks lovely in my kitchen and is not to big and makes professional cappuccinos! Love this coffee machine so easy to use & makes great coffee. Milk frother is good, usually like my coffee black but tried cappuccino which are lovely. Would recommend.